Peanut Thai Pasta Salad is the perfect summer pasta salad. It is full of spicy and savory peanut flavor and could not be easier to whip together. 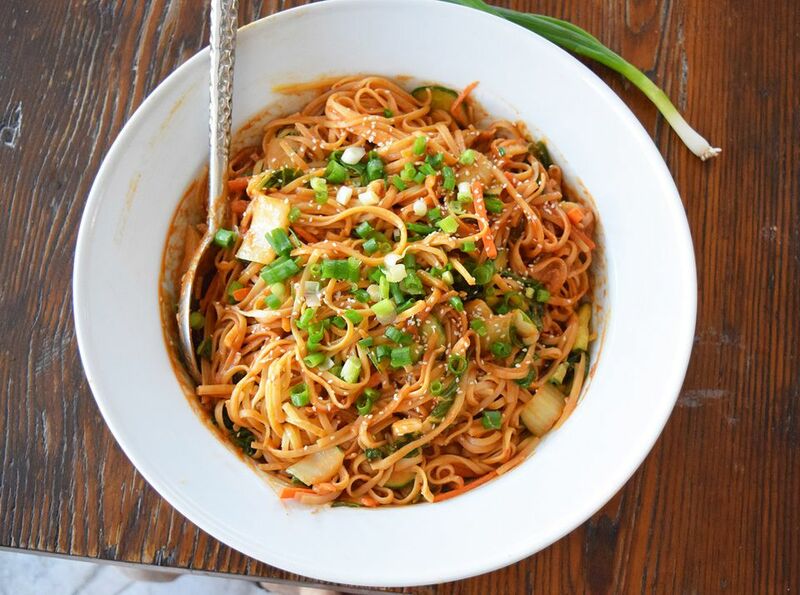 Simply blend all of the ingredients for the sauce in a food processor and top over the noodles and vegetables. Place it in to go containers and you've got the perfect picnic pasta salad! It's also the perfect amount to bring to a back yard barbecue. Serve it with some grilled marinated chicken or grilled shrimp for a complete meal. Change up the vegetables if you wish. Replace the carrots, bok choy, or cucumbers with red peppers, broccoli, snow peas, or any other fresh vegetables. This pasta salad is best served at room temperature. Plan to prepare it and then serve within an hour of making it. If you need to make it further in advance, just make the sauce, cook the pasta, chop the vegetables and then wait to combine until just before you are ready to serve. The peanut butter can seize up on the pasta if it is kept in the refrigerator for too long! Any dried pasta will do. The easiest ones to serve are shorter pastas like fusilli or farfalle. These two types also hold the sauce very well due to their nooks and crannies. This dish is delicious served in the summer but can also be enjoyed year round. Serve the pasta warm in the winter and fall. Combine the sauce ingredients in a food processor or blender, until smooth. Cook the pasta to an al dente texture or according to the package directions. Cut vegetables to desired thickness and width. Toss cut veggies with the soy sauce and lime juice in a separate bowl. Allow to marinate for 10-15 minutes if possible. Combine the noodles with the sauce and veggies until completely combined. Sprinkle the top of the pasta with scallions and sesame seeds. Serve with extra sriracha if desired! Serve immediately or room temperature. If preparing ahead of time, make the sauce, cook the pasta, and chop the veggies. Wait until you are ready to serve to combine all three together.